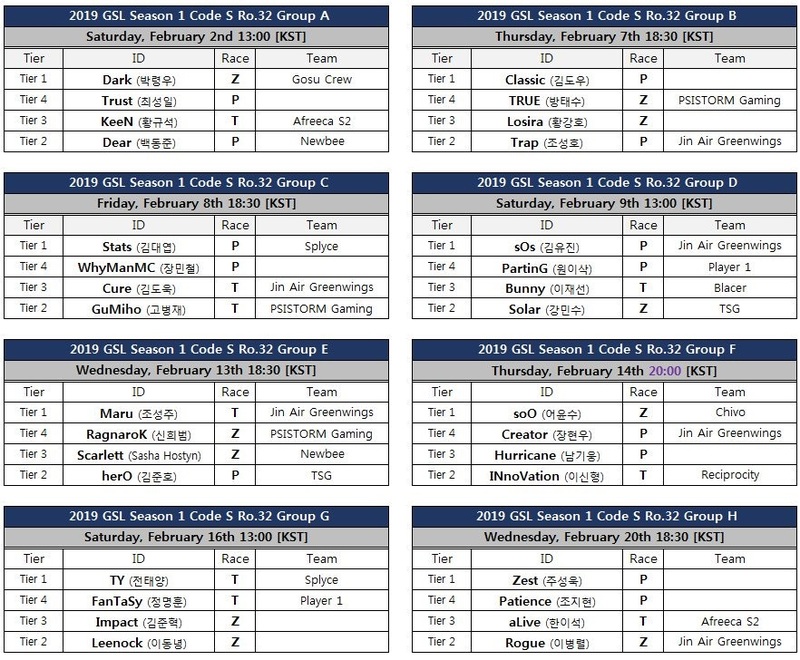 Looking at the names of the players, these groups seem stronger than recent ro32's in the GSL. But that does depend a lot on how well these former stars perform. Note the odd broadcast days. Groups are played on Wednesdays, Thursdays, Fridays, and Saturdays in a very compressed schedule. These groups are insane. Stats MC Cure Gumi? I hope fantasy wins this season. Wait, when does Dear join Newbee? anyone who thinks the bosstoss wont make it out of this group is insane. he will blink his way out in first place. heard it here first. Oh my god, how many times does Parting need to play sOs? Dear joining Newbee is cool but can we talk about Afreeca having players again? That makes the second Kespa team to have an SC2 roster. They signed teamless players that did well in the team league. KeeN, aLive and DRG I think. E: Also, unlike previous seasons, the runner-up and champion didn't get to choose their first opponent in the Ro32. These groups are actually all so good it's insane, cannot wait for this season to start! Group B: Classic has improved his PvZ to the such a level that I really can't see him not getting out. Second pick would be Trap probably. Group D: This is a group where I normally would say sOs and Solar 100% but Bunny has looked insane for the last couple of months (HSC etc. etc.) and PartinG has had countless deep runs in online cups. Honestly can't say, maybe sOs and Bunny? Grop F: 2 clear favorites in soO and INno who have played each other in a best of series more times than I have lived days, but I wouldn't be surprised if one of them drop to Creator, his series vs TY can't not be taken into account. Group G: Probably my favorite group, mainly because there's an extremely high chance that either FanTaSy (accompanied with again, insane online results+ST2 appearance) or Leenocktopus himself advance. DieuCure must be happy his boi has a decent chance of making it out in second place after the BossToss. Just saw Stats in the group. I have a good feeling about season 2 *whistles a tune*.